When our girls began their summer break, I was a little concerned about how the weeks would unfold. Of course, each summer is different. With my kids now 17 and 15, I wasn’t quite sure how things would play out. It’s not like you plan outings to the park, the playground, or head to the library for story time. A stop for an ice cream cone (while still welcome, believe me!) isn’t quite the highlight that it used to be. Then there’s the fine line to walk between allowing them relaxation after a busy school year and pure laziness. (Our 17-year-old has a job, which helps with that balance!) And while it’s nice to hang out with mom some of the time, they also want to spend time with friends. Between camps, piano lessons, and random cheer practices, there are a lot more moving parts than there were when they were 7 and 5. 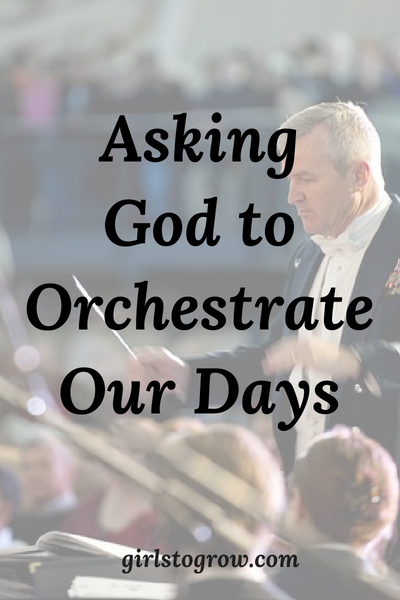 When I filled out my monthly prayer list for June, my request was that God would “orchestrate” our days. I’m not sure where I came up with that word. It’s not a natural part of my vocabulary. I don’t even know that I could have told you at the beginning of last month exactly what I meant by it. From Vacation Bible School being scheduled while my oldest daughter was gone to camp for two weeks (keeping my mind and body busy!) to her work schedule to the family times and outings with friends, I believe God is arranging our summer. So if I can trust God to do that for our summer, can’t I trust Him to do it all the time? I thought about areas of my life that need to be orchestrated, and here are a few I came up with. God is not going to give me more to do than the time I have to do it. Therefore, I want to ask for His help to arrange my time. I need to scrutinize my day and see where I’m wasting time (here’s looking at you, Instagram!) Then I can ask God to help me prioritize my tasks so that I use my time wisely. I’ve always loved hearing stories from people about how God coordinated their circumstances so that something good and unusual happened. Unbelievers would call it fate or luck, but how blessed we are when we recognize how God worked behind the scenes in our lives to accomplish His will. God brings people across our path. He will orchestrate better friendships for us than we could ever do for ourselves. We still have to do our part by being friendly and reaching out. Yet God can add to our lives people to minister to us, as well as people we can encourage. He can do the same for our kids. God knows what we need to grow. 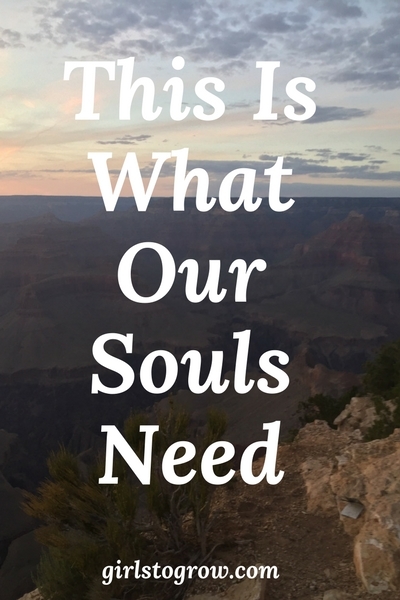 The trials, the mountain tops, the struggles…they’re all tailor-made for us individually. Remember Paul’s thorn in the flesh in 2 Corinthians 12? God used that to show Paul that God’s grace was sufficient, to reveal His power through Paul’s weakness. So God works in our lives to teach us about ourselves and about Him. So if we look back at our dictionary definition, what is the desired effect of this orchestration? That we learn to trust God with every part of our life, and to glorify Him. If that’s the goal, He knows better than we do how to accomplish it. Which brings us to one of my all time favorite passages. I pray that God will not only orchestrate the remaining weeks of our summer, but that each of us will allow Him to orchestrate our lives. Someone in our home (who is not my husband, lol!) has a tendency to complain. Actually, there’s more than one of us that get caught up in griping and groaning. Oh, how easy it is to be dissatisfied or annoyed! Those feelings can come from how another person acts, a situation that doesn’t go our way, or just random circumstances that we really don’t want to have to deal with in the moment. Often our complaints are about daily irritations. We’ve talked before about choosing gratitude instead of complaining, because you can’t do both of those at the same time! But sometimes, our “complaint” might be more along the lines of a personal hurt. Sure, it could be physical pain. It may also be an emotional struggle, like grief or regret. I think that was the case with David in Psalm 142. As I read those seven verses, I’d say part of his complaint may have been loneliness. He also appears to be discouraged about people who are persecuting him. So how did he handle it? Where David succeeded is where I often fail. 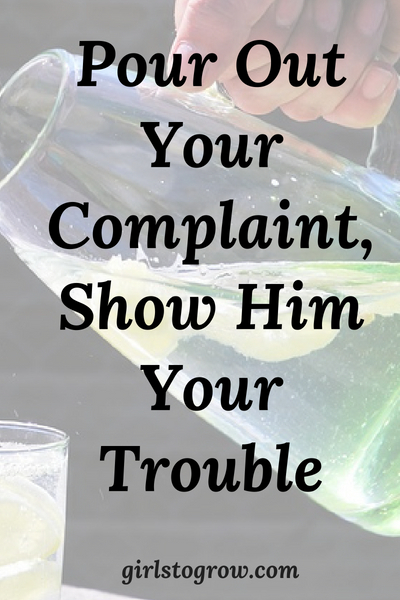 I want to share my “complaint” with my husband, my family, my friends – or, realistically, with whomever will listen. Yet in most cases, they likely can’t do anything to solve my problem. While they may care about me, they can’t provide me with peace or contentment. Instead, I need to choose David’s solution. Whatever my current complaint or trouble, I need to deal with it by taking it directly to God. Don’t you love the words David uses as he describes “pouring out” his complaint before the Lord? Let’s admit that sometimes we’re so full of our grievance that it just spills out of us. What a relief to empty ourselves of it, and allow it to flow over to a God who can handle it. Comfort comes as we realize that God knows our path. He is aware of exactly what is taking place in our lives. Not only that, He knows the end from the beginning. Perhaps God is just waiting for us to lay it at His feet. Can we share a trouble with a loved one and ask them to pray for us? Absolutely! But let’s also remember to take each “complaint” to God. Trust Him to replace our “overwhelmed” spirit with His peace. And then we can join David at the end of the Psalm, praising God’s name. “Old” age, perhaps? Information overload, maybe? Whenever my daughters ask me to do something, I give them free rein to remind me about it as many times as they need to! In the same way, if I don’t write something down while I’m thinking about it, it’s unlikely that I’ll remember it three minutes later. Forgetting details like buying milk at the grocery store or what time I need to pick my daughter up from cheer practice can be inconvenient for us. But today I want to talk about a truth that’s important for all of us to remember. In Deuteronomy chapter six, Moses addresses the children of Israel as they prepare to enter the promised land. In verses ten and eleven, he shares the blessings that await them there. Sounds like things are going well here! But verse twelve follows with this warning. When they finally reach the promised land…when they have plenty to eat, and are no longer surviving on manna…when they’re not moving a tent from one camping site to the next, but living in a house that’s “full of all good things”…that’s when they’ll be tempted to forget God. In the wilderness, they needed Him for daily survival. Yet when they’re living in the midst of abundant blessings, Moses warns them – don’t forget. They needed to remember all that God had brought them through, the deliverance from Egypt, the miracles in the wilderness. In a day when they might be tempted to look at what they had, and credit it to their own hard work, Moses says “no.” Remember all that God has done, and serve Him. How about us? What a tragedy it would be, amidst all the blessings in our lives, to forget to give honor and praise to the One who provides it all. I don’t want to forget how God worked through different situations this past school year. He brought us through some difficult days. He strengthened my faith, in spite of how weak it was in the beginning. Yet how easy it is to let days slip by without expressing gratitude to God for His goodness. At times we, too, may start to take credit for what has happened. “It’s because I prayed for this” or “Since I’ve been living better, this good thing happened.” Yes, God answers prayer. Out of His mercy and grace, He moves in our lives. He blesses us as we honor and obey Him. By verse 14 of Deuteronomy six, Moses is talking about the Israelites choosing to go after other gods. If we forget to acknowledge God in our lives, we’ll have the same temptation. We’ll want to honor ourselves or find something or someone else to follow after. On the other hand, just as the Israelites would face many battles before they actually possessed Canaan, so we may currently be in the midst of a trial. Despite all we’ve been given, maybe we just don’t “feel” blessed. On those days, may our minds be filled with the truths that God’s grace is sufficient, our eternal future is sure, and His power is limitless. As we make this conscious effort to remember what God has done, we can then follow the command of verse seven. In the day-to-day “busy-ness,” let’s remember to teach our children about the faithfulness and goodness of God. We can acknowledge all of our blessings, and give praise to the God who has provided them! So beware! 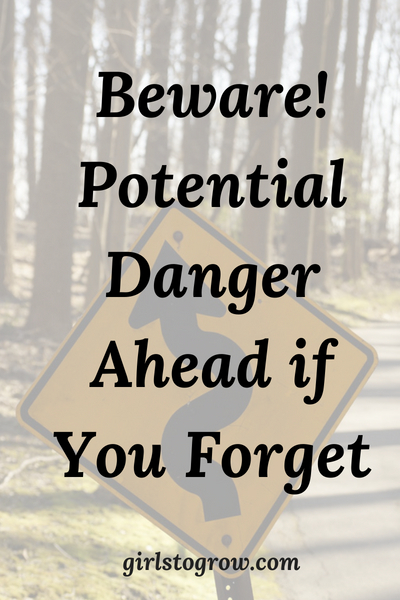 Be alert to the dangers of forgetting God and failing to praise Him. Then we can avoid the danger of living our lives outside of His guidance. So I think my husband and I have a great “working” relationship. He teaches an adult Sunday School class at our church. Occasionally he’ll use a point or illustration from my blog in his lesson. Sometimes I’ll take a truth I’ve learned from his Sunday School lesson and write about it on the blog. We’ve been studying Jonah recently. Our last Sunday School lesson touched on Jonah’s self-centeredness. The prophet Jonah had little compassion for anyone else. His focus was on following his own plan rather than going where God directed. Jonah, himself a recipient of God’s mercy, didn’t care about that mercy being shown to the people of Nineveh. As I listened on Sunday, I didn’t need anyone to point out to me that I’ve been self-centered lately. I knew it. I’ve been complaining and feeling sorry for myself. Ever been there? When we’ve been saved for awhile, I think we usually know when sin in our life needs to be dealt with. Typically, we know what to do about it. But that doesn’t mean it’s easy. For example, I know that to combat my self-centeredness, I need to ask for God’s forgiveness and for the Holy Spirit’s help to overcome it. My next step is to actively look for ways to serve others. That’s the best way to get over myself. Philippians 2:3 says it pretty succinctly. Or we can boil it down to the second greatest commandment, love your neighbor as yourself. My self-focus will diminish if I turn my thoughts to giving to others. In this case, we’re not talking about money. 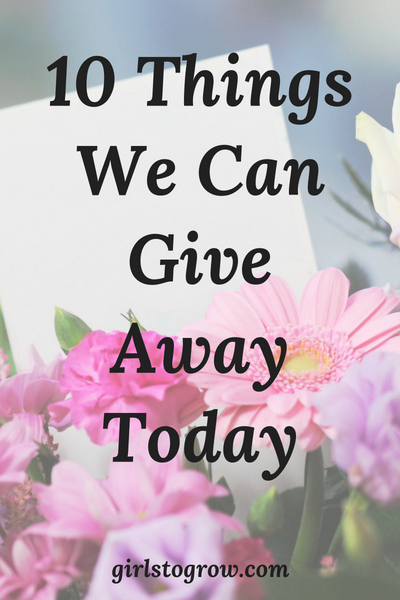 Rather, there are more valuable things I can give away today that will bless those around me – and, in turn, help loosen the grip selfishness has had on me. 1. …time to those things in my day that are most important in view of eternity. I’ll make it a priority to read my Bible, pray, etc. 2. …kind words to my family. That means thinking before I speak. 3. …smiles to people I come in contact with all through the day. I want to show them the joy that Christ gives. 4. …thoughtful gestures to my husband. I’ll think of ways, no matter how small, that I can bless him. 5. …encouragement to a fellow believer. Maybe it’s a phone call, a text, or a handwritten note that can bless a friend who’s struggling. 6. …thanks in each situation. The Bible tells me that’s the will of God for me. 7. …attention to what is going on at the moment. I won’t be distracted, but will give the person in front of me my full attention. 8. …the benefit of the doubt to someone when I don’t understand what’s going on. I won’t easily take offense or jump to conclusions about why they acted a certain way. 9. …appreciation to people who help and serve me. I don’t ever want entitlement to creep in! 10. …remembrance to needs people have asked me to pray for. Then I can follow up with them and find out how God has been faithful to work in their lives. My natural bent is to be self-centered, but God’s Holy Spirit can empower me to be others-focused. Since I’ve been dealing with a bout of selfishness lately, I hope that giving some of these things away will get me headed in a better direction! Whom Can I Serve Today? Can God Really Do That for Me? Have you ever found that you believe something to be true in your mind, but it doesn’t translate to how you’re reacting in your circumstances? Recently I was burdened about a certain situation. It came to mind often throughout the day. Whenever it did, I tried to take it to God. My prayer life became quite busy! And while I’d like to say that I was a great woman of faith and trusted God to answer in His way and in His time, I wasn’t. Rather, I still found myself fretting and worrying about this situation that was mostly out of my control. I knew God could answer. I prayed that His will would be done. In this instance, it was fairly clear what the right outcome should be. After a whole lot of praying, and more time passing than I wanted to, God answered. And, as is often the case, I learned a lot through the hard days and in the waiting. After all, there were people involved whose hearts needed to be changed. It was beyond my realm of control…but not His. A quote about this verse from the Jamieson/Fausset/Brown commentary caught my attention. Actually, maybe it’s not that surprising. Moses was human. And I know how easy it is, in spite of all that God’s done for me in the past, to doubt that He’s able to do it again. Slow to learn, that’s me. But God did what Moses thought was impossible. 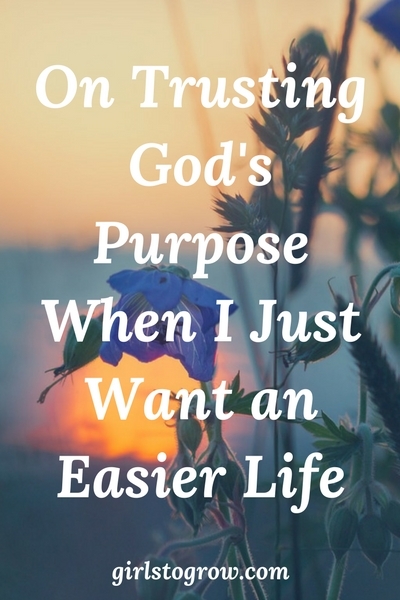 Because there’s nothing that’s too hard for God. He “that is able to do exceeding abundantly above all that we ask or think” (Ephesians 3:20) is still in the business of answering prayer. His power isn’t diminished. The same God of the Old Testament patriarchs is the One we pray to today. He’s just as able to meet our needs and answer our prayers as He was back then. What do you need the Lord to do for you? Is there something you’ve been praying for – as best you know in God’s will – yet you struggle to find the faith to believe that He can accomplish it? The Lord’s hand is not waxed short. Whether we have a personal need, a heartbreaking family situation, or any other circumstance we feel is too difficult for God to impact, remember – God is powerful. The “Spirit that raised up Jesus from the dead” (Romans 8:11) is alive and active. May we be faithful to pray and to trust, then stand amazed as we see Him work. What Sarah Teaches Me About Faith? 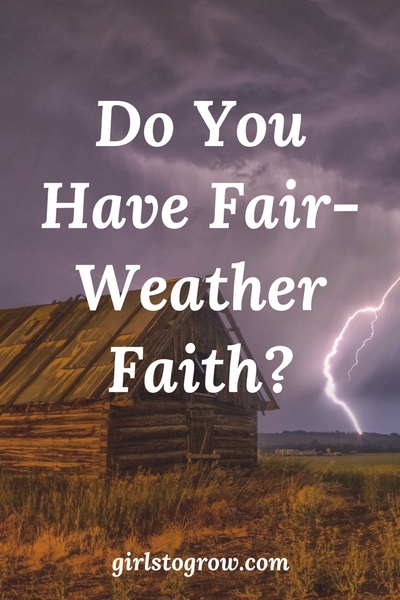 Do You Have Fair-Weather Faith? We’ve probably all heard the term “fair-weather friend.” Maybe you’ve even had one or two of these people in your life. It’s a person who’s our friend when our lives are clicking along smoothly, and it’s convenient for them. However, they disappear at the first sign of trouble or when it’s no longer easy for them to be with us. Sometimes as Christians we can have “fair-weather faith.” It’s a faith that loudly sings the words to “Trust and Obey” in a church service when we’re happy and circumstances are good. But when a trial comes along, it gets pretty quiet. When we’re seeing prayers answered, we give a testimony about trusting God, and how He came through in our situation. Yet when we’ve prayed for relief from a hardship, and it hasn’t gone away, we may secretly doubt God’s faithfulness. I see three men in the Old Testament who had genuine faith, not the fair-weather kind. I’m sure you know the story found in Daniel 3. King Nebuchadnezzar tells Shadrach, Meshach, and Abenego that they’re going to be thrown into a fiery furnace. They’ve refused to obey the command to bow down and worship his idol. Death is imminent. I think this qualifies as a trial. Yet their faith is not shaken. When a trial comes, we pray for deliverance. In our humanity, we pray to escape the trial as quickly as possible. And we have absolute faith that God can do that. So, if you’re like me, we pray what we believe is best for us. I’ll take the shortest route through this difficulty, thank you very much. I think Cherie Hill says it well in her book, The Problem of Prayer and The Promise That Changes Everything. And sometimes God answers that prayer, and we see a quick victory. But other times, our outcome may look like what happened to Shadrach, Meshach, and Abednego. You see, before their faith was realized, they had to go into the furnace. God didn’t rescue them from being thrown in. He only delivered them after He revealed Himself to them in the midst of it. God may not deliver us out of our trial, but He will deliver us through it. He wants to show us how to endure it as a good soldier. These three men submitted to God’s will regardless if it meant deliverance or death. And it’s through those kinds of trials that we will come to a deeper, sweeter relationship with Jesus Christ. Neither you nor I are facing a heathen king or a fiery furnace. But maybe today we don’t have enough money to pay the bills or we realize a child is making bad life choices. It could be a cancer diagnosis, a spouse who’s grown distant, or seeing the chance we had at a new and better job fall apart. If that’s where you are, hold on to your faith like Shadrach, Meshach, and Abednego. It’s a faith that says, “I know You can…but you might not.” Ask God to give you a faith that walks into the fire, still trusting Him. Rest in His promise to never leave you nor forsake you. And you’ll grow a faith that keeps you strong, no matter what the weather. Happy May 1st!! I’m so thankful that God built “fresh starts” into the rhythms of our world. Whether it’s a new morning, a new year, or a changing season, it’s good to begin again with a clean slate. Glad to be stepping into the next month! Here’s a question for you that I think I already know the answer to. Have you ever wished for something to be taken out of your life? It could be a person or a situation, any thing that makes your life more difficult. I was dealing with this last week. One morning I thought to myself, “If I just didn’t have to deal with this person any more, things would be so much better.” I was tired of interacting with someone I had a hard time getting along with. Then this question popped into my mind. “Why do you not want to deal with this person any more?” The answer came immediately – because it would make my life easier. And then I knew what the root of the problem was. It wasn’t so much about that person as it was about my selfishness. There was no thought that morning for the other person. 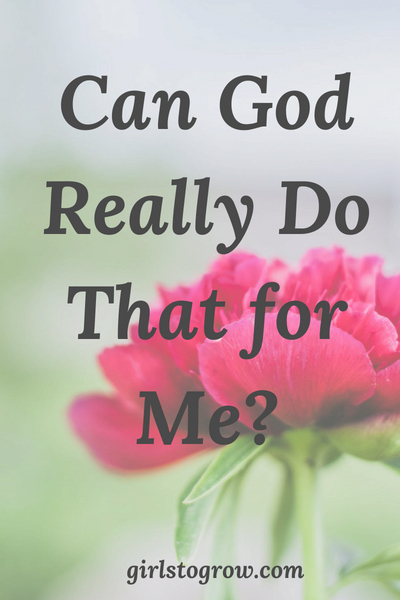 I hadn’t looked at him/her through the lens of how God might be able to use me in their life. Nor did I consider what God might be trying to do in my life through them. It was all about making life easier for myself by not having to deal with the conflict that person inevitably brings along with them. This struggle may not always center on a particular person. It might be a situation that’s hard to deal with, like an illness, a failed relationship, a job loss, or some type of persecution. I think of Paul’s thorn in the flesh mentioned in 2 Corinthians 12. Surely his life would have been easier if God answered His prayer to take the thorn away, but God didn’t. God had a purpose in allowing it to continue in Paul’s life. 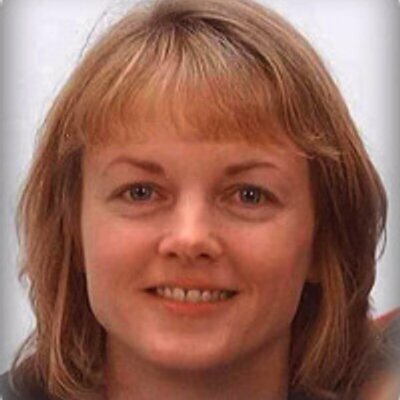 So how can I think differently about this difficult person? Maybe God has this person in my life so I can be a testimony and a witness to them. Perhaps as they see the joy and peace I have through Christ, they’ll want the same for themselves. I have no idea how He’s working in their life, but maybe I can be just a small part of that. And how about what God’s doing in my life through that person? I have my doubts that he/she knows or cares how they’re impacting me. So what is God trying to teach me about myself? Obviously He’s already used them to remind me again of how selfish I am. Life is not all about how I can get by with the least amount of trouble or irritation. No, those difficult people and hard days are actually a big part of maturing me in my faith. Is God growing my patience, teaching me self-control? Is He having me deal with this person because He knows that I’m going to be able to use this situation to help somebody else later on? I’m reminded of the illustration of a weaver creating a beautiful tapestry. All I can see from my perspective here today are the tangled threads underneath the tapestry. It’s not attractive, looks mostly like a tangled mess. But God sees it from the top side, a work in progress. He’s weaving the pattern that will produce the beautiful finished product. And parts of my life – like that person I’d rather not deal with – don’t make sense to me. Yet it’s all orchestrated by Him as part of His master plan. I like this wording of 2 Corinthians 4:17. “For our light and momentary troubles are achieving for us an eternal glory that far outweighs them all.” When I consider eternity, this person or circumstance will just be a blip in the story of my life. I don’t know if you’re dealing with a difficult person or a troublesome situation today. In our humanity, we don’t want to face either because it’s painful, exhausting, and hard. But let’s try to look beyond how it makes us feel. Let’s move past our selfishness, and trust God’s purpose in it. Whether I can see it or not, God wants to use that person or that situation to grow me into being more like Him. He can also turn it into a blessing and use it to encourage others. Let’s trust God for the grace to allow Him to accomplish His purpose through it. You may have noticed that doing what’s good for you isn’t always pleasant or easy. Case in point. My family doctor wants me to eat a diet that’s low in fat to bring my cholesterol numbers down to where they need to be. In my head, I want that, too. But that’s not how I always choose to eat. Sometimes the doughnut or the cookies ‘n’ cream milkshake or the baguette slathered in butter wins the day, because that’s what I want in the moment. Eating in a healthy way consistently isn’t always easy for me. But let’s move beyond food choices and my battle with choosing apple slices over chocolate chip cookies. It’s also like visiting the dentist. During my appointment, it hurts to have the hygienist scraping my teeth. But I know that doing that on a regular basis is what will keep my mouth healthy. And while I know it’s good for me not to gossip, it’s not always easy to control my tongue. Yet God gives us commands and principles in the Bible that we’re to follow. And according to this passage in Deuteronomy, His commands are for our good. God doesn’t give us commands or “rules” because He wants to keep us from having any fun in life. He gives them to us because He knows what’s good for us. He knows that as we live according to His Word, we will gain what truly satisfies our souls and gives us lasting joy. For example, God commands us to tithe or give money to our local church. Does God need our money? No. But He knows that as we give, we become generous. Generous people reflect Christ in a way that draws others to Him. 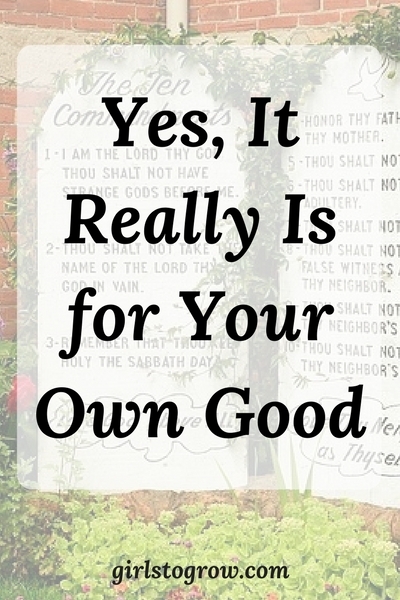 How about one of the original ten commandments, from Exodus 20 – don’t covet? God knows that if we get busy looking around at what others have, we’re going to become discontent and bitter. Do you know anyone like that, always complaining because someone else has better “stuff” than they do? Is that person fun to be around? On the other hand, God commands us to be thankful. Why? Because then our attitude will be one of gratefulness for what we have. We’ll be content with God’s provision. Every command of God’s is for our ultimate good, even those that we find hard to obey. Love and pray for your enemies, do all things without complaining, be anxious for nothing – yes, those, too. And while we try to wrap our heads around this for ourselves, I think it’s also good to talk it through with our children. Are they going to see that us saying “no” to something they want to do is for their good? Likely not in the moment. Nor are they going to necessarily be excited when we set certain restrictions on their tv-watching or what music they’re allowed to listen to. But as they grow to know our hearts and sense our love for them, hopefully they’ll come to understand. And what a responsibility we have to seek God’s wisdom as we make those decisions in our homes. So when you come across a command in the Bible that you think is going to be difficult to follow, remember that God’s given that command because it’s going to produce a good thing in your life. In the end, He’s seeking to conform us into His image. And that’s definitely a good outcome! Does your soul ever thirst for worship? Sometimes it can be the part of our spiritual life that gets overlooked. All too often we come into God’s presence with our list of needs and wants, in a hurry to get down to the business of asking for His help with our problems. And He certainly wants to bear our burdens, give us guidance, grant us peace. But how sweet it can be to take time just to be with Him. To set aside the prayer requests, and quiet our minds. To be still. To think about God’s greatness and His holiness, His love and His mercy. That’s what I needed one morning last week. One way I like to worship God is to take a Bible verse that’s full of praise, and meditate on it. The verse may talk about His mighty works, or it may describe one of His attributes. In fact, I wrote a whole post about that titled 10 Bible Passages of Praise for Worshiping God. You can read it here. I also like to worship through music, and that’s what I chose to do last week. Our daughters’ high school choir sang Only God in the recent state fine arts competition. I’d listened to it several times, and had it saved on my phone. In a quiet moment, I was able to really focus on the words. I was reminded again what a great and powerful God we serve. Whenever I hear songs like this one, I like to imagine heaven filled with all of our voices lifted in worship. What an amazing sound that will be! These verses go well with the song below. “Only God can move a mountain; only God can calm the sea. Only God can heal a wounded spirit–only God, only God! Only God can hear my heart’s cry; only God my sin atone. Only God can give us calm assurance–only God, only God! Only God can be our Refuge; only God can be your Strength. Only God will stand as our Defender–only God, only God! Only God is the Power; only God in majesty. Only God will reign as King forever–only God, only God! Holy is He, Holy is He, Holy is He. Who heals me from within? And sets me on my feet again? The One I praise today! Who hears me in my loneliness? Who finds me where I hide? ‘Til I let Him inside? My Savior and my Own! Holy is He, Holy is He, Holy is He! Let’s make it a priority to spend some time just worshiping God. He is worthy of all our praise! Share with me a worship song you love! Can you identify with the following incident I shared on the blog a few years ago? I tossed and turned as the possibilities went from bad to worse. Pretty soon I was practically panicked, allowing fear of what might happen to make me a nervous wreck. Here’s what’s interesting about that story. I could have written those same words last Friday night. Yes, I was basically in much the same boat, just regarding a different situation (one still related to my children, of course!). A number of times in the Bible, people are told to “fear not.” Maybe that’s because fear is an emotion that’s easy to give in to. It doesn’t take much for most of us to let our imaginations run wild with all the possibilities of bad things that can happen. I like these words related to battling fear from Melanie Shankle’s book, The Antelope in the Living Room. In both cases of mine above (plus many more times I won’t mention), that’s exactly what happened to me. Fear crept into my mind. It may have started as a small concern, but I allowed it to totally blow things out of proportion. Not only that, but I was fearful of events and reactions that might not even occur. 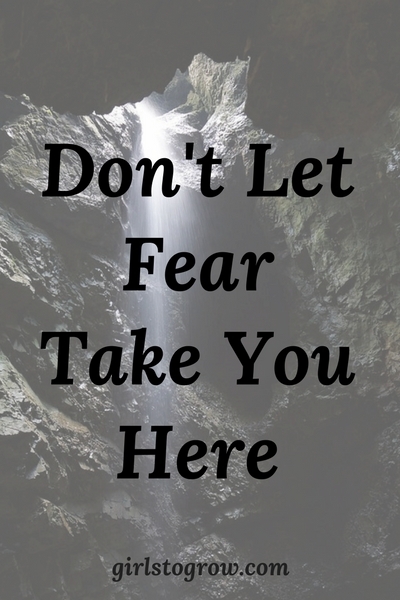 Fear can take us lots of places in our minds that we don’t need to go. One of my favorite Bible verses on fear is II Timothy 1:7. Any feelings of fear we have are not from God. His plan for us is that we trust in Him. His Holy Spirit gives us the power to have peace ruling in our hearts. We can rest in His goodness and faithfulness. So what do we do when those middle-of-the-night fears start to come? How about meditating on Psalm 34:4? Pray. God will hear. And He has the ability to deliver us from ALL our fears. There’s not a one that’s too big for Him to handle. And Deuteronomy 31:6 reminds me that He’s not going to leave me in my fears. If I picture God holding my hand as I face my fear, and hear His voice saying He will help me, I can have the courage I need to send that fear packing. Our fear will not accomplish anything positive. It will only make us citizens of Crazy Town! Let’s don’t let fear take us there!! Have you struggled with fear? What helps you get through those times?